No Credit Given, this Norman Rockwell painting, appeared on the cover of Peoples Popular Monthly published May 1917. An alternate title for this painting is Shopkeeper and Two Children. This was the first cover by Rockwell to appear on Peoples Popular Monthly. 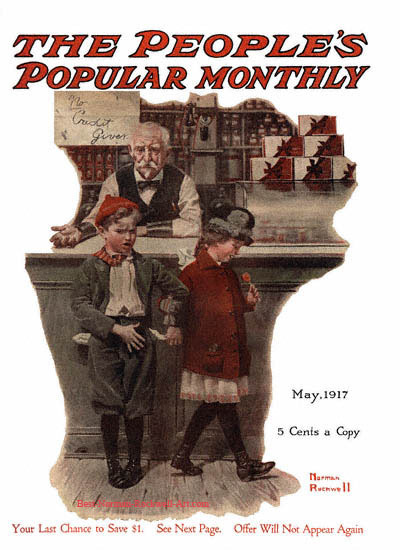 Peoples Popular Monthly only published three Rockwell covers, all in 1917. Rockwell only submitted to this smaller magazine after the publishers of the larger magazines had declined to publish the cover illustration. You can see the other two Peoples Popular Monthly covers here: Girl with Christmas Doll and Two Boys Making Ice Cream. Clearly, Rockwell's first choice of publication was The Saturday Evening Post. He believed that the Saturday Evening Post cover was America's biggest showcase window for artists. And his career confirmed this. The original oil on canvas painting is part of the collection of the Midwest Museum of Amereican Art in Elkhart, Indiana. The painting is reproduced in one Rockwell commentary book. It appears on page 65 of Norman Rockwell, A Definitive Catalogue by Laurie Norton Moffatt. This is another of those rare Norman Rockwell's. I found this one on eBay. I have only seen it for sale that one time in over three years. These two children have just made their pilgrimage to the general store. Both have candy on their minds. The boy's pockets are turned out to show that he has no money to spend. Surely he knows the store owners policy by now. "No Credit Given" says the sign behind the counter. The girl obviously brought some money with her, She is leaving with a sucker in one hand and a disappointed friend in the other. Will she share a few licks on her lollipop with her less fortunate friend.